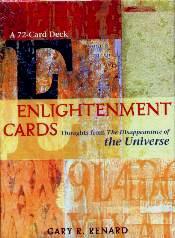 These 72 cards, apparently, are "guaranteed to accelerate your spiritual progress and help you achieve enlightenment". Pretty powerful words. These are the thoughts of author Gary. R. Renard's Ascended Master Teachers, and relate to his book The Disappearance of the Universe. I've not read this book but to me, its title suggests the end of everything as we know it. However, reading these thoughts, I found them to be encouraging despite the first card: "We are appearing to you as symbols whose words will help facilitate the disappearing of the universe". I'm not sure I want this to happen. I guess you could pick cards randomly and think about what you read throughout the day. Thoughts that struck me as appealing, include: "The world needs another religion like it needs a bigger hole in the ozone layer"; "Always remember to let other people have their beliefs. It's not necessary to get other people to agree with you", and "How much success or money you get has nothing whatsoever to do with how spiritually enlightened you are". Visit Gary Renard's website at www.garyrenard.com. Conclusion - Words to live by.